Nature Age was an exhibition presented at Deleon White Gallery in Toronto in 2003. The series comprises 3 large sculpture/Installation works; Nature Age: Beyond Stonehenge, Potato Sculpture I, II, III, and A Soul Lost in the Genome (Âme Perdue dans le Génome). 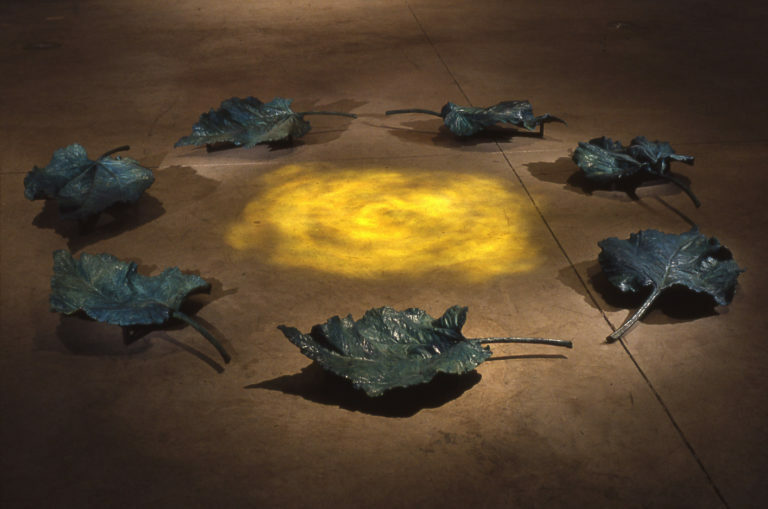 Nature Age: Beyond Stonehenge comprises seven large cast bronze leaves positioned in a circle with a light projection using moving light colour and cut metal gombo flame projecting a fire of light in the middle of the circle of leaves. The work is meant to express how today is the time of nature and proposes a temporal projection from the Stonehenge crematory site to the present. When the viewers would walk across the installation flames of light would run along their body and animate the site; the viewers would become part of the artwork. Potato sculpture I, II, III is a multimedia installation of three large cast bronze potato sculptures, three TV monitors built for floor screening and sound. The work expresses human impact on nature through the representation of our senses; sight, taste, hearing. On each potato column a different human part is transplanted; eye, mouth and ears. The work is meant to provoke an awakening of transgenic manipulation development in agricultural research. The potato columns also express human survival through historical food crisis more specifically recalling the Irish and in reference to Canadian history of agricultural development. A Soul Lost in the Genome (Âme perdue dans le Génome) is a multimedia installation work based on a theatrical stage set strategies developed for Macbeth play when ghosts appear on the scene. The work is meant to express how through genetic manipulation between species unexpected result may affect the future of the living. The artist extrapolates and presents a cast aluminium pig head that has grown along a tree trunk. A concept of illusion is conveyed throughout the artwork where the tree is an image projection or a reflection from a light box located on the ceiling of a black painted wooden black box. Inside the viewer can see, along with the back opening, a cast aluminium pig head surrounded by a dozen cast aluminium pork chops suspended as if they were replacing the leaves and if on the tree trunk had grown a pig head. 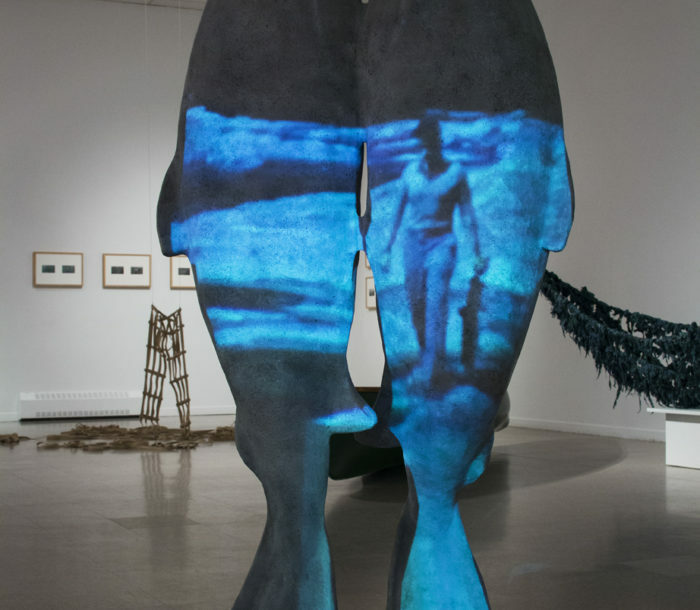 When the viewer approaches the work from the back of the installation he becomes part of the artwork and the viewer looking through the front can see a human being walking in the ghostly landscape.